Yes, San Diego has a coyote problem, and we have learned how to solve it! More and more coyote are living in the canyons and expanding into suburban and urban areas. We provide professional coyote trapping and removal services here in the Greater San Diego CA area, and are certified dealer-installers of the leading coyote prevention device, the “Coyote Roller”. We service downtown, Oceanside, Vista, Carlsbad, Escondido, San Marcos, Encinitas, Solana Beach, Ramona, Poway, Santee, Lakeside, El Cajon, Spring Valley, Lemon Grove, National City, Chula Vista, and Imperial Beach. If in doubt about our service range, just call. We will match our competitor's prices, although few companies can actually do professional coyote trapping like we can. We believe that our quality of work is second to none. We have been in business for a decade, catching coyote, fox, and other animals. Customer testimonies on request! About San Diego coyotes - They are one of those animals which tend to cause a lot nuisance for people. They usually live in forests, but can also approach your house if your house is close to such a region. These wild animals tend to cause a lot of problems for people. They could get into your house and hunt your pets. They could also come and look for food in your house regularly. They might get into your yard and hide at a place which they find comfortable. They can also be harmful to children since coyotes are wild animals and could hurt humans as well. Most importantly, Coyotes carry a lot of diseases with them. If they visit your house regularly in search for food, then you might catch the diseases which it carries. This calls for a reason to prevent this animal from getting into your house and get rid of it as soon as you can. In this regard, let us have a look at the options you have in order to get rid of Coyotes. The main reason why a Coyote might approach your house is food. Coyotes are looking for food in various regions and if they find food at a place once, they return to that place in search of food. This means that you should try to get rid of all the food sources which are available in your house. This could include any food pots left in your yard for your pets or other food remains. If your yard is clean and free of any food remains, then a California coyote might not even bother entering your house. However, keep in mind that a Coyote might kill your pet for food. This means that you should not leave your pets out in the open if there are coyotes in your area. San Diego coyote trapping might be a good option at this point. One of the best ways to prevent a Coyote from entering your house is to make sure that your yard is clean. San Diego coyotes are looking for dirty places to hide. If there are a lot of bushes in your house, then the Coyotes might enter your house to hide comfortably in the bushes. This is why it is recommended to keep you yard as clean as possible. You should cut all the grass and bushes short so that you are clearly able to see if a Coyote has entered your house. You should also consider not leaving your garbage bins filled at night. Coyotes might look in your garbage bins in order to find food. This means that if you put a garbage bin outside your house at night, the Coyote might end up spreading all of that garbage on your garden floor. This will surely create a mess. In order to prevent this from happening, you should cover your bin with a heavy lid which the coyote cannot open. You can also consider putting the garbage bin outside your house in the morning. This is because coyotes are usually scared of light and will approach your house normally when it is dark. If you have tried all other options and they have not worked, then you should consider using traps in order to catch the Coyotes. Using traps to catch a Coyote is surely a difficult thing to do because of its large size, but our San Diego coyote removal company can do it. You will firstly need to get a huge cage which can easily accommodate a Coyote. The trap should be designed in such a way that once the coyote enters the cage, it gets trapped in it. You could put this trap in your yard at the place where the coyote comes regularly. However, keep in mind that Coyotes easily recognize human odor and will not come close to anything which smells like humans. This is why you should consider digging a hole and putting your cage into that hole. You should also put some meat at that place in order to attract the Coyote. Once the Coyote comes to get the meat, it will get trapped in your cage with ease. However, keep in mind that you should be trained enough to go through your process so you do not end getting yourself harmed by the Coyote. Once the San Diego coyote has been trapped, you can take the cage to a remote location and release the Coyote over there so it does not return to your house. You could also kill the Coyote by poisoning it, but it is not at all a good idea. The best way to get rid of Coyotes is to prevent its entry by keeping your house clean and free of food for that animal. If you are able to do that successfully, then you surely do not need to worry about Coyotes entering your house again. 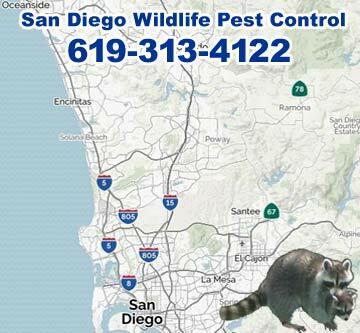 We operate a professional wildlife removal company operating in the San Diego CA area, including the towns of Oceanside, Vista, Carlsbad, Escondido, San Marcos, Encinitas, Solana Beach, Ramona, Poway, Santee, Lakeside, El Cajon, Spring Valley, Lemon Grove, and all of San Diego County. We do NOT service areas south of San Diego including National City, Chula Vista, or Imperial Beach. We specialize in the humane removal of wild animals from buildings and property. We commonly remove animals from attics, provide bat control and rat control, and also general wildlife trapping and repair and prevention services. We also perform San Diego Bee Removal. We are fully licensed and insured, and operate 24 hours a day, 7 days a week. Call us at 619-313-4122.